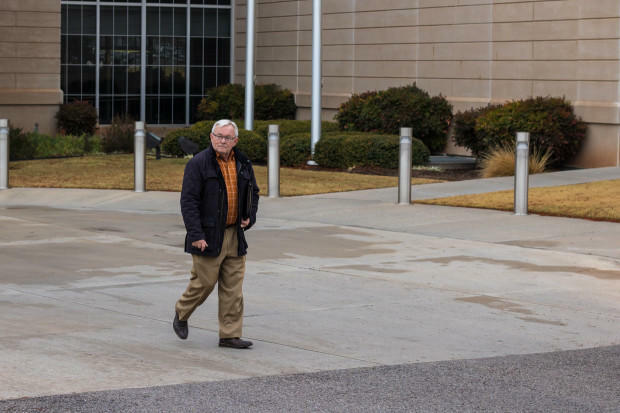 Mickey Thompson, founder and director of Restore Oklahoma Now, leaves the attorney general's office after filing paperwork for State Question 795. Mickey Thompson has a manila envelope tucked under his arm as he walks towards the Oklahoma Capitol. If the paperwork doesn’t start a fight, it almost certainly will add fuel to one. Inside the envelope is the handiwork of about 10 people over a couple of months that could clear a path for Oklahoma voters to do something most lawmakers won’t consider: Enact broad tax hikes on oil and gas production to help fund public education. Thompson is the founder and director of Restore Oklahoma Now, a nonprofit recently organized to draft SQ 795 and raise the money needed to get it on a ballot. For 15 years, Thompson led the Oklahoma Independent Petroleum Association, a major industry group, before he stepped down in 2005 to run a startup energy firm. Thompson says he also makes money from a small family oil operation. The state levies a 7 percent tax on oil and natural gas production. Many wells are discounted for the first three years, making the effective gross production tax rate around 3.2 percent. Education advocates have pushed to raise oil and gas taxes, as have Democratic lawmakers and some of their Republican colleagues, but efforts to negotiate an increase stalled during the 2017 legislative session and a late-summer special session amid intense lobbying from oil and gas groups. If approved by voters, SQ 795 would restore the historical 7 percent tax rate — a move the Oklahoma Tax Commission estimates could bring in $288 million a year — and direct most of the revenue to schools. “About 90 percent of it for common education, and the rest of it for early childhood development,” Thompson said. State Question 795 faces many of the same hurdles on the ballot as it did on the floors of the House and Senate. Tax increases are unpopular among many conservative voters. In 2016, 60 percent of voters defeated a 1 percent sales tax hike to fund education. OIPA, the group Thompson once led, and other industry groups like the Oklahoma Oil and Gas Association, already are mounting a strong campaign to defeat the measure with messages likely to resonate with tens of thousands of Oklahomans whose lives and livelihoods depend on the state’s top industry. Some people think the easiest way to fix Oklahoma’s revenue problems is by increasing GPT. Margaret Phillips of Mueggenborg Realty understands that would mean fewer homes on the market and fewer eligible buyers. When Thompson was head of OIPA, he fought hard to persuade the Legislature to give oil and gas companies tax breaks. “Hell… I wrote most of those,” he said. “I didn’t work at the Capitol and I wasn’t a member of the Legislature, but most of the tax incentives that were enacted during the ’90s — and were later reenacted in the aughts — those came from our office. Thompson, the son of schoolteachers, said he’s frustrated that schools and students are suffering as discounts and tax breaks for the industry remain. Other factors are in SQ 795’s favor. One biggie: Data suggest Oklahomans want teacher raises and more money for schools. “Poll numbers say that people in Oklahoma will support teacher pay rise across the political spectrum,” Thompson says. Also, unlike the defeated sales tax effort, everyday Oklahomans wouldn’t pay for this tax increase directly. Still, State Question 795 has some practical roadblocks. The attorney general has yet to approve the title and language. If that happens, Thompson says Restore Oklahoma Now will likely need at least $3 million to get its message out — and 123,000 signatures before the question even makes it on a ballot.